The Center for Disease Control (CDC) estimates that 36,000 people die from the flu or flu-like illness each year, and another 5,000 people die from food borne illness each year. And your best protection from this type of illness is frequent hand washing. Available for daily, weekly or monthly rentals and refilled with wipes as needed by CALLAHEAD. Appx. # of uses: 1,320. When fresh water and soap is not available and a portable sink is not an option, CALLAHEAD is proud to present the TOWELETTE STAND as a hand sanitizing alternative. Scientific studies have proven that hand-to-hand contact is a major cause for illnesses, which can be prevented through proper hand sanitizing. Scientists estimate that up to 80% of infectious diseases are transmitted by touch. Because of this shocking statistic, every construction job site, special event or other public location demand proper hand sanitizing capabilities for hygienic protection. CALLAHEAD’s TOWELETTE STAND is a convenient way to safeguard you and those around you from germs and bacteria that cause many serious diseases and infections such as influenza, E.coli, salmonella, meningitis, and gastrointestinal infections. 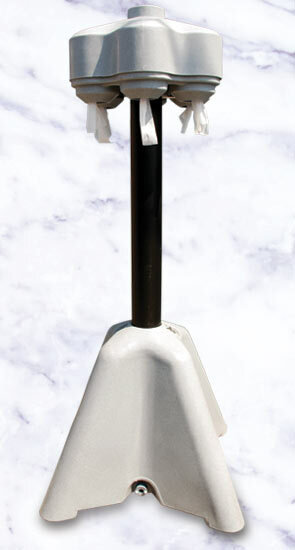 The attractive heavy duty polyethylene TOWELETTE STAND is at a height just over 5 feet and has 6 dispensers each filled with 220 wipes for quick and easy sanitizing capability. Each dispenser is sealed and protected so there is no risk of contamination from leaks or previous users to ensure every wipe is germ-free and maintains its maximum disinfecting ability. The TOWELETTE STAND has a total capacity of 1,320 wipes that kill over 99% of germs and bacteria yet they are still gentle to your skin with the soothing benefits of aloe vera. CALLAHEAD’s sanitary wipes meet the Food Code’s Hand Sanitation Requirements making the TOWELETTE STAND ideal for any food venue. 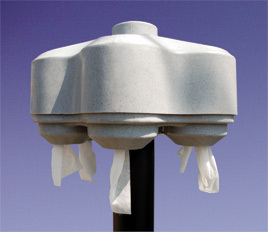 Excellent for large job sites or special events, the TOWELETTE STAND will remain firmly in place as its base is filled with 23 gallons of water for stability. The TOWELETTE STAND is ideal for special events or locations to safeguard young children from spreading germs such as playgrounds, schools, daycare facilities, birthday parties, petting zoos, communions, bat mitzvahs, graduation parties etc. Although soap and water is the best form of protection, it may not always be possible for every location, which makes the TOWELETTE STAND an ideal alternative. CALLAHEAD recognizes the vital need for every human beings overall health to have some form of hand disinfecting facility available and has a hygienic system to suite every client’s requirements. It’s the quality and and variety of our equipment, along with unsurpassed service that make CALLAHEAD the greatest company for all your portable sanitation needs for a healthy lifestyle. CallAHead Corporation at 1-800-634-2085 offers portable sinks and washbasins for rent when you want to offer a cleaner work environment for your construction site or special event. CallAHead services all of New York City including NYC's five boroughs (Manhattan, Queens, Brooklyn, Bronx, Staten Island) as well as Westchester county and Nassau and Suffolk counties on Long Island. Simple to keep hands clean when water is not available. • Kills over 99% of dangerous germs on contact including E.coli and salmonella. • Safe and gentle. • Fast acting sanitation. • Dries in seconds. • Contains moisturizing aloe vera to maintain healthy skin. • Excellent for any public venue to safeguard adults and children from harmful germs and bacteria that can cause serious illness. • Moist towelette removes dirt and grime. • CALLAHEAD installs wipes which meet the Food Code's Hand Sanitation Requirements making them ideal for any location food is cooked and served.